McIntosh is Editor of FreedomInfo.org , published by the National Security Archive . Burr is Senior Analyst at the National Security Archive, where he directs the Archive's nuclear history documentation project. 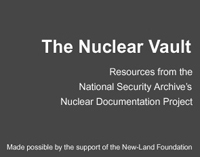 See the Archive's Nuclear Vault resources page. Since the drafting of the essay for this e-book, Freedominfo.org and the National Security Archive's Nuclear Vault have obtained, from a non-Agency source, the proposal referred to in the essay that was made to the Board of Governors in 1996 for a more liberal disclosure policy. The eight-page proposal from the IAEA Secretariat is dated February 15, 1996, and titled "Proposal for the Derestriction of Board Documents." The language of the document is similar to a one-line description of the policy provided previously by an IAEA staffer - the disclosure of "most" Board documents after two years. However, the final policy may not be identical to the proposal. The Secretariat's proposal suggests a variety of motivating factors. It points out that the classification categories being used at the time - "RESTRICTED Distr." and "For official use only" - "have never been defined and are subject to differing interpretation." It also notes that "the trend within the United Nations generally, as within the Agency, is towards greater transparency." Further, the proposal says that Member States handle IAEA documents domestically in accordance with national criteria and thus "no doubt exercise different degrees of restrictiveness." The Secretariat's proposed disclosure policy provides substantial grounds for withholding documents, including "any other documents specified by the Board." 8. 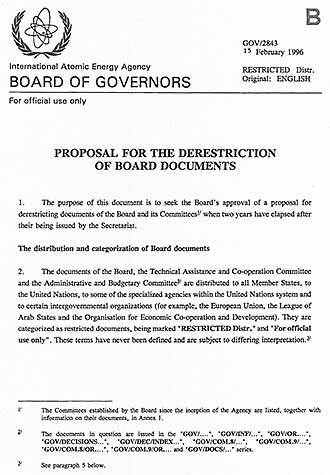 In the light of the foregoing, it is proposed that, with the exception of the annual Safeguards Implementation Report, documents relating to deliberations of the Board in closed session, documents to whose distribution there is a legal impediment and any other documents specified by the Board, documents of the Board and its Committee be derestricted two years after the year in which they were issued, all such documents issued in or before 1993 being derestricted with immediate effect, all such documents issued in 1994 being derestricted with effect from 1 January 1997, etc. It is further proposed that documents subject to the exception provided for earlier in this paragraph be derestricted by the Board at a later date if the Board decides, in light of information provided by the Secretariat, that the grounds for maintenance of the restriction no longer exists." The proposal further specifies six document series to be covered by the policy, such as "GOV/DEC/..."
It recalls that there was a time when some Board and committee documents, marked "PARTICIPANTS only," were not made available to all Member States. A footnote describes a progressive change in the Board's rules to permit more access and involvement by Member States not on the 35-member Board. Washington, D.C. April 24, 2015 - The nuclear inspection agency that is central to the current Iran negotiations is flunking international transparency norms, according to a report posted today by Freedominfo.org and the National Security Archive's Nuclear Vault. Key documents about International Atomic Energy Agency (IAEA) proceedings, found in various national archives and private collections but closed at Agency headquarters in Vienna, are included in today's posting. The investigation found that an important transparency policy document (see sidebar) is itself secret, since the IAEA Board of Governors has never officially announced or disclosed its 1996 decision to release its documents after two years - a decision honored more in the breach than in the observance. In today's posting, Toby McIntosh and William Burr of the National Security Archive discuss and analyze the IAEA's failure to create an effective disclosure policy. Despite the Agency's 1996 decision, essential records such as minutes of the Board of Governor's meetings have remained closed even from the 1950s when the Agency was created. Moreover, critically important parts of the Agency's historical archives in Vienna are out of bounds to researchers, creating major obstacles for historians and social scientists attempting to tell the story of this vital organization. The secret disclosure policy and the unwelcome mat are just two indicators of this important agency's failings in the area of transparency. But the most significant transparency gap is that the IAEA has no comprehensive policy on disclosing information. There is no formal system to request records, nor are there public procedures or standards for declassifying very old records. FreedomInfo.org/Nuclear Vault in late November 2014 began asking the IAEA if it has a disclosure policy, and to describe it, but no answers have been provided. In late March 2015, an official said: "Your query has been passed on to a committee that deals with decisions regarding what past documents issued by the Board of Governors are to be made public. It also deals with the issue of document disclosure policy." "The IAEA has never been very transparent and it seems that in the last four years the transparency that existed has declined," said Tariq Rauf, former Head of Verification and Security Policy Coordination at the IAEA and the Director of the Stockholm International Peace Research Institute's Arms Control and Non-proliferation Programme. I've been going to general conferences now for 10 years, as a nongovernmental representative, and I've seen it go from an organisation with remarkable transparency to an organisation that is increasingly closing its doors. And it relates not only to access to documentation information but also access to meetings. Something that once was ingrained in the Vienna spirit, and it is today no longer there, sadly. Since its creation in the mid-1950s, the IAEA has played an increasingly central role in nuclear energy policy around the world. While one of the Agency's major purposes has been to promote the civilian use of nuclear power, it has received great prominence from its role in supporting the Nuclear Nonproliferation Treaty (NPT): by maintaining safeguards to ensure that member states do not use civilian facilities for military purposes and by using its investigative powers to determine whether member states have created facilities that are inconsistent with the NPT's objectives. The IAEA's major role in the Iraq crisis and the current controversy over Iran are well known, but the Agency's safeguards monitoring activities had their start decades ago, in the 1960s and 1970s, when the construction of the nuclear nonproliferation system was underway. "Transparency is an elusive commodity in international nuclear affairs,"wrote Mark Hibbs on June 9, 2014, in the blog Arms Control Wonk. "Routinely cited as a universal virtue and not without a certain sanctimoniousness, this aspiration is sacrificed time and time again on the altar of political expediency," commented Hibbs, a Berlin-based senior associate in the Nuclear Policy Program of the Carnegie Endowment for International Peace. The agency's secrecy has deep historical roots. Observers and Agency officials say the limits on transparency stem from the sensitive subject matter involved. Deference is given to member nations' concerns about the confidentiality of their nuclear installations and their own roles in policy discussions. "The members rule, and they don't want a lot of information that you would think you'd want available, shared," according to Henry Sokolski, executive director of the Washington-based Non-proliferation Policy Education Center. "It would be helpful if there were a bit more candor," he said, recalling being shown a nonpublic report that indicated how frequently observation cameras in one country were out of commission. According to Anna M. Weichselbraun, a University of Chicago scholar, "I don't want to say it [the records policy] is to hide the things they do poorly." But, she continued, "I think they are very afraid of criticism." She believes that "the agency does incredible work that is not recognized because of a lack of transparency." Weichselbraun sees a strong "public interest in having the records derestricted" and she recently argued for more openness in an article published by the Nuclear Proliferation International History Project at the Woodrow Wilson Center for International Scholars in Washington, D.C.
A PhD candidate at the Department of Anthropology at the University of Chicago, Weichselbraun was imbedded in the Agency as an intern in the Safeguards Division while she worked on her dissertation, "Regulating the Nuclear: The Semiotic Production of Technical Independence at the International Atomic Energy Agency," using "rigorous linguistic anthropological analyses of the actors' interactional, ritual, and documentary practices." The debate about improving safeguards has been marked by "the tone of suspicion and distrust directed at the secretariat, triggered by perceived lack of transparency," Laura Rockwood, a former IAEA lawyer, wrote August 28, 2014, in Arms Control Today. She is a senior research fellow at the Belfer Center for Science and International Affairs at Harvard University's John F. Kennedy School of Government. 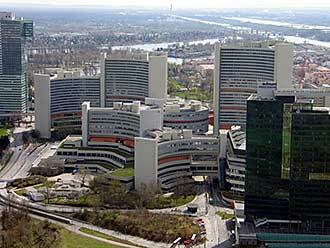 IAEA headquarters in Vienna, Austria. Another researcher who makes the case for more IAEA transparency is Cindy Vestergaard, a Senior Researcher at the Danish Institute for International Studies, who has been studying "the front end of the fuel cycle" -- the steps of mining and milling, conversion, enrichment and fabrication of uranium. Some of the IAEA's requirements in this area are spelled out in a nonpublic series of Policy Papers, particularly papers numbered 18 and 21. These policy papers, prepared by IAEA staff, detail adjustments to verification requirements regarding uranium production and were made in response to technological changes. There may be Agency policy papers on other topics that could be of interest to outside experts and researchers. Not making these Policy Papers public impedes research and public discussion of policy, in this case about the chosen starting points for verification. As Vestergaard put it: "It doesn't make sense, if this is the starting point that is being clarified, why is it not being made available." Efforts to follow the workings of the IAEA's most important policy-making body, the Board of Governors, are inhibited by closed meetings and a dearth of documents. The 61 foundational rules guiding the operations of the Board, which meets five times a year, discuss related topics -- internal circulation of agendas and documents, and the preparation of meeting summaries -- but there is no section on disclosure of such information. In 1996, however, the 22-member Board decided that "most Board documents should be derestricted after two years and could then be made available upon request," in the words of an agency official. As a result there is no clarity about what Board documents should be released. The word "most" lacks definition. One exception has been the release of reports about Iran's compliance with so-called safeguard inspections. The most recent such report, released March 4, 2015, had been leaked to the media weeks earlier. It is called "Implementation of the NPT Safeguards Agreement and relevant provisions of Security Council resolutions in the Islamic Republic of Iran." The February 19, 2015, report was later derestricted "at the request of a Member State during the Board meeting," according to an IAEA official. Other such reports on Iran have been posted online. IAEA observers believe more safeguards implementation reports [SIR] should be released. At the March Carnegie forum, former IAEA official Rockwood said, "The secretariat has, over the years, made numerous proposals to the Board that it release the SIR. I personally think it should be done." "As these records have all been digitized for internal use, they could easily be made accessible to the public on the IAEA's website through a dedicated portal with search features," recommended Weichselbraun. The four-day Symposium on International Safeguards in Vienna in October was attended by more than 700 international experts, but was closed to the press and the public. The papers presented, on topics such as "Challenges in Spent Fuel Verification ," were later made public. Access was restricted so that participants would not be "inhibited" during discussion, spokeswoman Gill Tudor said in an e-mail to Bloomberg News. Only the opening and closing ceremonies were open. The approved resolutions and other documents are found under the "records" tab of the GC website, sometimes with a time lag. The Director General's National Security Report 2014 is another example of apparently slow public release. It is now available, on the records page for the 2014 GC, held in September, but it is dated July 22. 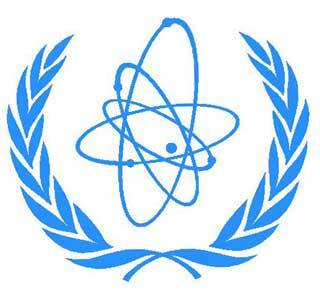 There is no indication on the IAEA website that it was made public in July when distributed to members. The IAEA's historical archives consist of some 5,574 linear meters of records -- in a variety of media formats. But the Agency has no policy governing how long sensitive records should stay closed or when restrictions should be dropped. "There is no regular, systematic review and declassification procedure in place," according to Weichselbraun. "Individual requests for declassification or derestriction in the past have shown that there is a lack of transparency on which records remain classified and for what reasons." Researchers can have access to historical records, those over 30 years old, as long as they are not classified. Access to records that are less than 30 years old requires the consent of the Agency's Director and the consent of the government about which the report was written. For historians of nuclear nonproliferation policy, the records of the Safeguards Department are especially important because the safeguards system has been central to the Agency's role in supporting the Nuclear Nonproliferation Treaty since the 1970s. While safeguards records can include commercial secrets (e.g. relating to the design of nuclear reactors) which complicates opening up the archival records, it is an insufficient reason for keeping all of them closed. Further inhibiting research is the lack of "finding aids," commonly produced by archivists to orient and guide researchers, Weichselbraun pointed out. "In addition, researchers should be able to submit requests for ad hoc declassification reviews that can be tracked. An ad hoc review process should follow a systematic procedure with a timeline of expected outcome, as well as provide justification." She also said the agency should move from a 30-year restriction period to the 20-year period used in many other international organizations. The IAEA limits individual researcher visits to five consecutive days per month. "This is an unreasonably short period for serious scholarly inquiry," wrote Weichselbraun. Inadequate resources are provided to the IAEA Archives and staffing needs improvement, she said, commenting that "the persistent shortcomings in providing information about the Archives' holdings and rules of access raise questions about the Agency's commitment to transparency." "[H]istory is key to making informed contemporary decisions," Hamblin wrote. "Fortunately some of this documentation is available, scattered in national archives and private collections throughout the world," he said. "But you won't find it at the IAEA in Vienna." "The IAEA claims it is obliged to withhold documents until all of the countries mentioned in them agree to declassification. In practice, this guarantees permanent secrecy." Reflecting on the agency's role, he observed that it "is uncomfortable with historical facts about the quality of its workmanship." For example, records of Board of Governors meetings from 1958 can be found in the National Archives of both the United States and the United Kingdom, two of the Agency's members. The documents of the Board and its committees are distributed to all Member States, to the United Nations, to some of the specialized agencies within the UN system and to certain intergovernmental organizations. They are considered "restricted," an IAEA official wrote, adding "(but the Agency is of course not in control of how the recipients treat the documents they receive)." The exchange of information among members and from members to the IAEA is discussed in Article VIII of the 1957 Statute of the IAEA. The dissemination of that information appears to be encouraged: "The Agency shall assemble and make available in an accessible form the information made available to it.." This is interpreted, however, to mean sharing among the members. Article VIII of the statute refers to sharing information about peaceful uses of nuclear energy. One way this is applied is through the IAEA International Nuclear Information System, one of the most successful and comprehensive information systems on the peaceful uses of nuclear science and technology. A hint of the sensitivity surrounding transparency can be seen in the minutes of a 2010 Committee of the Whole meeting about "Strengthening of the Agency's technical cooperation activities." A representative of the Czech Republic recommended adding the words "as well as the transparency," so that a section of the policy would read ".. to continuously improve the effectiveness and efficiency as well as the transparency of the TC programme in accordance with the needs of Member States in all areas of concern.."
12. The representative of the PHILIPPINES said that she had doubts about the suggested addition of the words "as well as the transparency". A call for improved transparency of the TC programme might be taken to imply a lack of faith in the management of Agency technical cooperation projects. When "transparency" appears in IAEA documents, which is fairly rare judging by a search of the IAEA site, it usually refers to communications among members, as it does in this paragraph of a 2010 document, titled "STRATEGY FOR THE TECHNICAL COOPERATION PROGRAMME IN THE EUROPE REGION." Maintain an appropriate balance between the security and availability of information, further improve physical and information security and enhance the Department's security culture. Notwithstanding the references to "increasing knowledge" among the public of IAEA verification systems and keeping "stakeholders informed," the Agency's record in implementing these goals leans far too close to nondisclosure. Forty years ago, officials with U.S. government agencies saw the IAEA's lack of transparency as a problem, especially after India's May 1974 "peaceful nuclear explosion," which made many in the general public wonder about the effectiveness of the Agency's safeguards (even though India's CIRUS reactor was outside the system). A draft message prepared in September 1974 by staffers at the U.S. Atomic Energy Commission discussed the "need for the Agency to deal in a forth-right way with the concerns" about the lack of publicly available information on safeguards. As an example, the AEC draft suggested that the Agency could "contribute to a sense of assurance" about the effectiveness of safeguards by "providing detailed data on what is actually done . at specific facilities," while still protecting the proprietary information and commercial secrets of the members. A message from the U.S. Mission to the IAEA in December 1975 also addressed this problem: the Mission had been "actively pursuing with the IAEA Inspectorate the possibility of obtaining detailed information for the purpose of increasing public knowledge of actions and findings of the IAEA in implementing its safeguards." The Mission reported that it would be working with the Inspectorate to "encourage the earliest and most effective results," but it appears that those discussions made no headway. 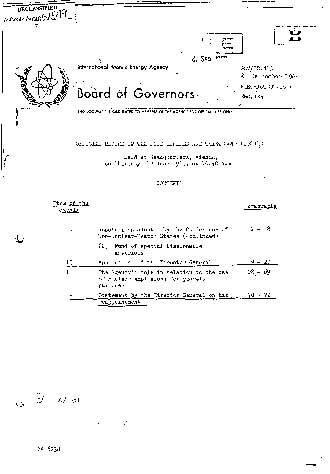 This is an example of an early meeting record of the Agency's Board of Governors. As the Agency was only months old, discussion focused on organizationalissues, specifically whether to establish a scientific advisory council, and the development of a fellowship and training program which became a core Agency activity over the years. This record is unavailable at the Agency's Vienna archives because Board of Governors meeting records are closed. Diverse agency information and documents show up in the U.S. National Archives. One such item is a report on safeguards for an NPT. In early 1967, when it was evident that some sort of treaty was in the works, Benjamin Sanders, a career official in the safeguards division, wanted the Agency to be ready. In a report to inspector general Alan McKnight, Sanders estimated what it would take to safeguard the known nuclear facilities of the prospective signatories to a Treaty. Using projections through 1969, he calculated the numbers of facilities in non-nuclear states that would require inspection and how many inspectors would be needed to monitor them. According to the calculations, by 1969, the non-weapons states, including Euratom members, would have 120 reactors along with 24 reprocessing and fuel fabrication plants. To inspect all nuclear facilities in the non-weapons states, including Euratom, the Agency would need 75 inspectors by 1969, some of whom would be resident, living in or near countries with more extensive safeguards requirements. Arguing that "early action" was essential, Sanders wanted the Agency to be ready by 1969; even if a treaty was finalized in 1967, agreements would have to be negotiated, and staff would have to be recruited. "By then the nuclear effort of the countries involved will have proliferated enormously and the urgency of applying [effective] safeguards will be immense." This record of a Board of Governors Meeting recorded several substantive developments and decisions: the reappointment of Sigvard Eklund as Director General (he served the Agency from 1961 to 1981), the possible creation of a special Agency fund of enriched uranium to assist the power reactor programs of non-nuclear weapons states, and the potential role of the Agency in the use of nuclear explosions for peaceful purposes (PNE). The last topic produced some amusing banter; discussing the Agency's report on the matter, the Italian delegate Carlo Salvetti took exception to the assumption that the Agency would necessarily play a central role in helping states "benefit" from PNEs. "The tone of paragraph 13(b) of the draft report was somewhat reminiscent of the fairy-tale in which the stepmother used to ask the mirror: "Mirror, mirror on the wall. Who is fairest one of all?" The Agency, however, was taking its fairness for granted without even consulting the mirror. The Agency might well become the prettiest girl in the world of peaceful nuclear explosions; it was somewhat early to say that it was already." The U.S. Representative Henry D. Smyth, author of the Manhattan Project's Smyth Report, "pointed out that the Agency only wished to enter the beauty contest." The IAEA had expelled Taiwan from membership in 1971, in favor of the People's Republic of China. The organization nevertheless had safeguards agreements with Taiwan, including a trilateral Taiwan-U.S.-IAEA agreement, which it continued to enforce. In 1972, the IAEA had begun to inspect nuclear facilities in Taiwan, with strong U.S. support because Washington had been concerned about Taiwan's nuclear ambitions. This document reproduces the text of the Agency's interim report of its inspection in July 1975. The information in the document is complex and highly technical in nature but what comes across clearly is that the Agency deployed visual monitoring systems at the Taiwan Research Reactor to ensure that nothing untoward happened (e.g., removal of spent fuel for surreptitious reprocessing into plutonium). The monitoring system originally consisted of cameras, but technical problems led the Agency to replace them with a closed circuit TV system which, according to the inspection report, was "operating very successfully." With the failure of the cameras the Agency needed to conduct "extensive" gamma radiation measurements of the spent or "irradiated" fuel to ensure that it had been used as the reactor operators claimed and not, for example, in a way that would maximize plutonium production. Other installations were inspected, such as a reprocessing laboratory which could be used to produce plutonium from spent fuel but which was too small "for serious production scale reprocessing."